This water-sound is intended for the haiku-master or entity to which it is addressed, and may contain confidential and/or privileged material. If you are not the intended recipient of this water-sound, you are hereby notified that any use, review, retransmission, dissemination, distribution, reproduction, or any action taken on reliance upon this water-sound is prohibited. If you received this water-sound in error, please contact the leaper and delete the material from any poem. Any views expressed in this water-sound are those of the individual frog and may not necessarily reflect the views of the pond. is a writer, composer, and performer. His music and writing have been published and presented in Canada, the US, and Europe. He received a PhD in Music Composition and was the récipient of the 1998 KM Hunter Foundation Artist Award. Seeing Stars, a YA novel, was a finalist for both CLA YA Book of the Year, and an Arthur Ellis Award. He teaches creative writing courses at McMaster University and music and creative writing at Hillfield Strathallan College. In addition to many vertebrate publications, he is the author of numerous invertebrates, many from his own serif of nottingham editions. Barwin lives in Hamilton, Ontario and online at garybarwin.com. has been an editor at both filling Station and dANDelion and special editor of Whitewall of Sound and Open Letter. In addition to his magazine editing work, he was the editor/publisher of housepress and is the author of several books of poetry, including with wax (Coach House Books, 2003). 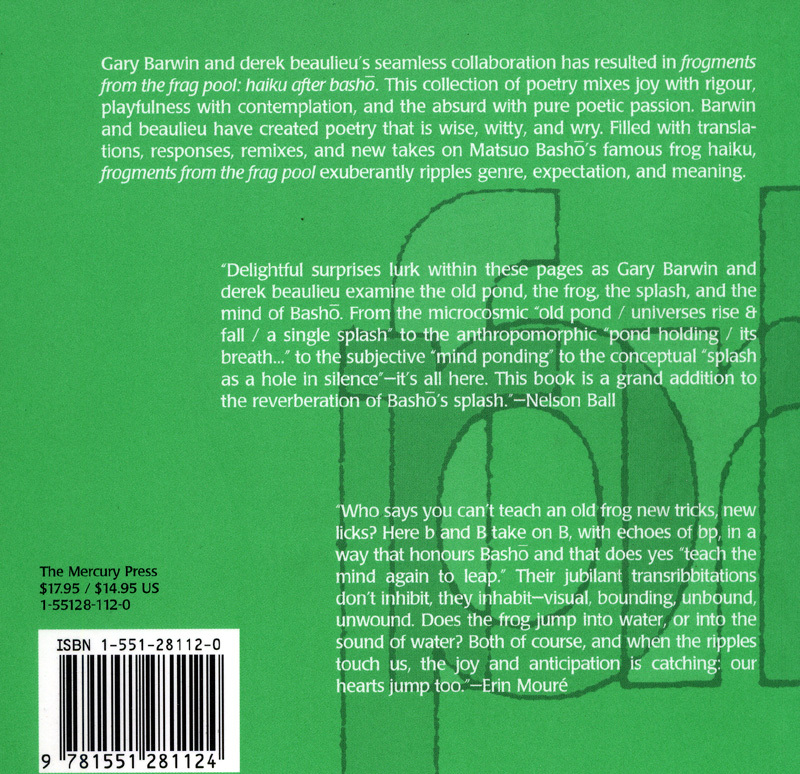 derek is also the co- editor of Shift B Switch: New Canadien Poetry (The Mercury Press, 2005). His poetry, criticism, and artwork have appeared in magazines and galleries across Canada. He lives in Calgary with his young daughter.